Times of San Diego home page early Sunday evening. Times of San Diego‘s monthly readership exceeded 200,000 in October and November as San Diegans turned to online news in the run-up to and aftermath of the Presidential election. The independent news website recorded 235,374 different readers — technically “unique users” — in October, and 214,429 in November. The October number is a 33 percent increase from the previous year, while the November total was up 47 percent. The site’s readership throughout the two-month period was young, local and mobile. Readers aged 34 and younger accounted for 30 percent of readership, while those between 35 and 54 accounted for 39 percent, and those 55 and older 31 percent. Smartphones were used in 53 percent of reading sessions, tablets in 9 percent and traditional desktops and laptops in 39 percent. The website uses responsive design to automatically resize for different screens. Readers in the City of San Diego accounted for 27 percent of reading sessions, while those in other cities in San Diego County accounted for another 15 percent. Readers elsewhere in Southern California, notably Los Angeles, made up another 10 percent. The site focuses on San Diego news, but articles about the military and politics are often read far beyond Southern California. 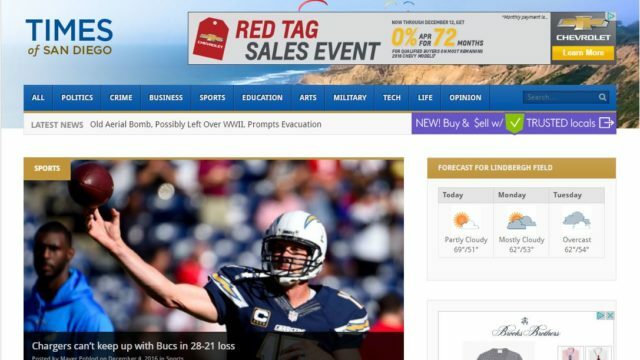 Times of San Diego uses the industry-standard Google Analytics software to measure its traffic and readership for advertisers.